Nothing brings spontaneous moments of smiles and tears like family celebrations. For loved ones with dementia, however, those moments can be far and few in between. Yet, when they do occur, they are priceless. It is for these reasons, among others, that celebrating is an important part of socialization for individuals with dementia. And it is beneficial for families as well. That’s why, at Anthem Memory Care communities, celebrations have become a way of life. 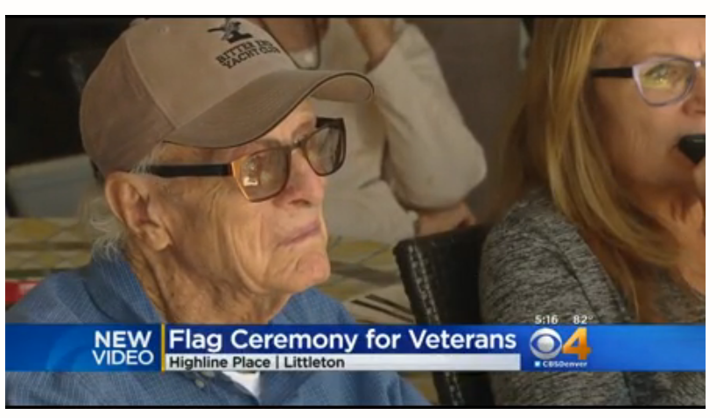 Highline Place Memory Care in Littleton, Colorado, recently celebrated Flag Day in a way most of us have never experienced. Troops stationed at nearby Buckley Airforce Base were invited to perform a special flag ceremony to celebrate the day and to honor veterans who have served their country. The ceremony brought everyone outdoors to the flag poles on a beautiful June day to witness the spectacle. Two Highline Place war veterans sat front and center as the service men proceeded to lower two American flags, present them to the veterans and raise new flags in their place. The service men were rewarded in return with a salute from the veterans. And there were smiles, and even a few tears, all around. A reporter from Channel 4 CBS Denver was on hand to cover the event. As the reporter noted in her coverage, “Military service has played a major role for these residents lives and events like these help rekindle those memories.” You can watch the video of the news coverage here. Celebrations are part of all of our lives, keeping our traditions alive and bringing loved ones together. And for those with dementia, they may even rekindle an old memory or two. How often do you mark special occasions with your loved one with dementia? Be sure to find time to celebrate, even the smallest of achievements and milestones. You will find it well worth your time and effort. Our Anthem community residents, families and staff certainly do!